North Korea says it may test a hydrogen bomb over the Pacific Ocean after Donald Trump threatened to destroy the country, whose leader responded by promising to make a "mentally deranged" Trump pay dearly for his threats. Speaking in New York City on 22 September 2017, Ri Yong-ho, North Korea's foreign minister, said his country could consider a hydrogen bomb test on an unprecedented scale on the Pacific Ocean, South Korea's Yonhap news agency reported. Pyongyang may consider conducting its second hydrogen bomb test, in the Pacific Ocean, the North Korean foreign minister told the media, commenting on Kim Jong-un’s latest response to Donald Trump. "It could be the most powerful detonation of an H-bomb in the Pacific," Ri said, as quoted by South Korean agency Yonhap. In a rare statement directly attributed to the North's leader, Kim Jong-un has said Trump is "unfit to hold the prerogative of supreme command of a country". It is unusual for the North Korean leader to issue such a statement in his own name. "Now that Trump has … insulted me and my country in front of the eyes of the world, we will consider with seriousness exercising of a corresponding, highest level of hard-line countermeasure in history," Kim said. South Korea said a magnitude 3.0 earthquake was detected in North Korea on 23 September 2017, near the area where Pyongyang recently conducted a nuclear test. South Korea’s meteorological agency said it was analyzing the tremor, saying the initial assessment was it was a natural earthquake. The earthquake was detected in an area around Kilju, in the northeastern Hamgyong Province, and about 20 kilometers southeast of where the North conducted its sixth and most powerful nuclear test on September 3, South Korea’s weather agency said. The September 3 test registered as a 6.3 magnitude quake. All of North Korea's previous six nuclear tests registered as earthquakes of magnitude 4.3 or above. However, China’s official Xinhua News Agency said earlier that China’s seismic service detected a magnitude 3.4 quake in North Korea and saw the likely cause as an explosion. There was no immediate reaction from China's Foreign Ministry. South Korean and American intelligence authorities detected signs of massive excavation at North Korea’s nuclear test site. A South Korean source reported on 12 May 2017 that North Korea was excavating tunnel 4 at its Punggye-ri nuclear test site in North Hamgyong Province, mobilizing a number of coal mine vehicles. The source said that it was unlikely the North would carry out a nuclear test when excavation work was under way nearby, meaning an expected nuclear test would likely be delayed. There was speculation that growing pressure from the U.S. and China might have encouraged the North to postpone a planned test. China recently beefed up its pressure against Pyongyang by threatening to slash its oil supplies to the North. South Korea and the US closely monitored the North’s movement on the assumption that the tunnels at the Punggye-ri site are ready and that the North can conduct a nuclear test any time. KCNA reported 09 September 2016 that the Nuclear Weapons Institute of the DPRK made public the following statement: "Scientists and technicians of the DPRK carried out a nuclear explosion test for the judgment of the power of a nuclear warhead newly studied and manufactured by them at the northern nuclear test ground under the plan of the Workers' Party of Korea (WPK) for building strategic nuclear force.... The standardization of the nuclear warhead will enable the DPRK to produce at will and as many as it wants a variety of smaller, lighter and diversified nuclear warheads of higher strike powe..."
An earthquake of a magnitude of around five on the Richter scale had been detected from the North Korean nuclear test site. The European-Mediterranean Seismological Centre(EMSC) said Friday that it detected the tremor at 9 a.m., South Korea time, from Punggye-ri located in Kilju County, North Hamgyong Province. The Korea Meteorological Administration(KMA) said that the tremor occurred at 9:30 a.m., calling it an artificially-created quake. The U.S. Geological Survey(USGS) concurred to the KMA assessment, saying that the tremor originates from within one-kilometer below ground. The ROK government said 18 July 2016 that North Korea appeared to be ready to carry out a nuclear test at any time. Unification Ministry Spokesman Jeong Joon-hee revealed the stance during a regular news briefing, adding that the government is closely monitoring movements in the North and maintaining an all-out readiness posture based on close cooperation with the United States. Regarding any substantial developments related to the North’s preparations for a nuclear test, Jeong said he has no particular information. Japan’s Kyodo News quoted government sources in Seoul and Tokyo as saying that it is possible that Pyongyang will conduct a fifth nuclear test as early as July 2016, citing high levels of activity being observed over the past week at the North’s Punggye-ri nuclear test site. Since its fourth nuclear test in January 2016, the DPRK regime had been observed preparing for another nuclear test, but the speculation over the fifth nuclear test has been rising since the Seoul-Washington alliance’s decision to deploy a Terminal High Altitude Area Defense in South Korea. Two days after the THAAD deployment decision was made, Pyongyang threatened to launch “physical action” against South Korea and the US. Pyongyang threatened to conduct “a new form of nuclear test.” North Korea “made it very clear, we will carry out a new form of nuclear test. But I recommend you to wait and see what it is," North Korea's deputy UN ambassador, Ri Tong Il, said on 04 April 2014. 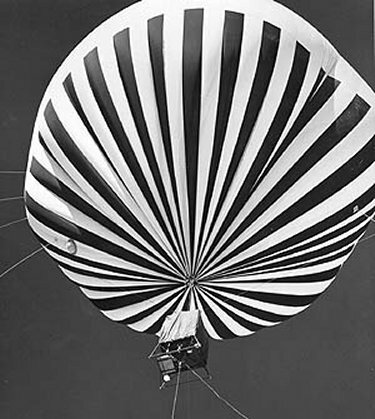 Balloons were used by the United States as test platforms at the NTS. Balloon shots were somewhat cleaner than tower shots because there was no steel structure to vaporize and contribute to the fallout cloud. Tests to determine the feasibility of balloons as captive detonation platforms were conducted in 1955 in New Mexico. The first use of a balloon was "Lassen," a 0.5-kiloton test on June 5, 1957. DeBACA was a balloon burst fired October 26, 1958. 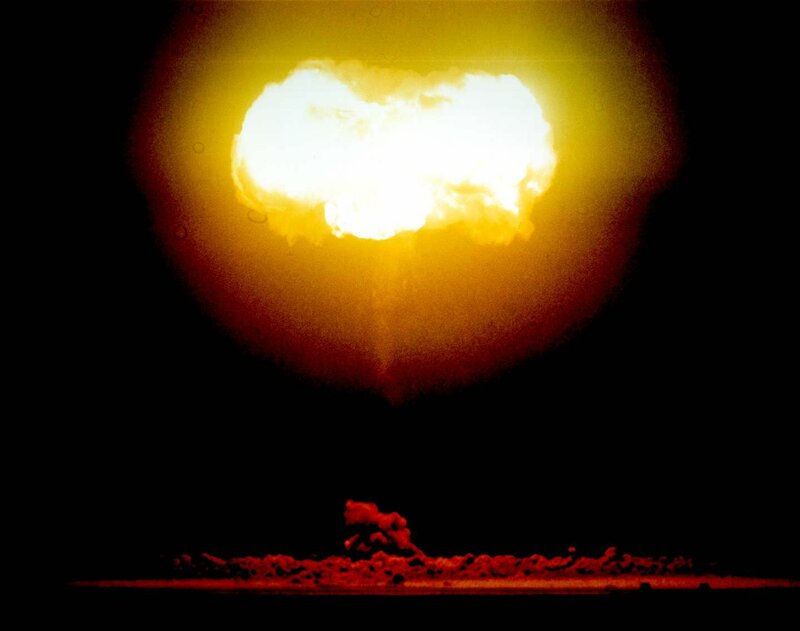 TRINITY, the First Nuclear Test ever conducted, was a 19 kiloton tower shot exploded July 16, 1945 in New Mexico. Test towers were built to heights of up to 700 feet. Structural strengths depended on conditions of the test. They towers contained as little metal as possible, partly for economy, but primarily to reduce the quantity of vaporized material contributing to radioactive clouds. Operation Plumbob in 1957 was the sixth in a series of continental tests conducted by the Atomic Energy Commission (AEC) to test laboratory design of weapons. The AEC and other government agencies also gathered nuclear effects data for military and civilian purposes, including creation of effective countermeasures. It was, in 1957, the largest series attempted in Nevada with 30 shots from early April to early October. Testing in Nevada could be accomplished more expeditiously and cheaply than possible in the Pacific, but was also useful in developing the next round of full-scale testing at the Eniwetok Proving Ground. These methods were superior to air-drop testing by allowing for more diagnostic data, while easing the fallout problem and speeding up firing schedules. The balloon series, including the Hood Event, was used for positioning test devices at higher altitudes and made its debut in Plumbob. The technique also eliminated steel tower contamination from vaporized metal that occurred during tower shots. In all, 13 devices were detonated at elevations ranging from 500 to 1,500 feet. In the Hood Event in the Plumbbob Operation a nuclear device was detonated from a balloon tethered at 1,500 feet. This was the biggest atmospheric test ever conducted at the Nevada Test Site. The most difficult step in balloon operations was the transfer of the weapon cab to the balloon and was accomplished only when surface winds did not exceed 15 knots, predicted on basis of wind persistence. These surface winds, known as balloon weather, accounted for only seven days delay. Unfavorable fallout predictions resulted in 9 days of delay on balloon shots, whereas 55 days delay were encountered on tower shots. Once the weapon cab was connected in series with the main balloon cable, the three guide cables connected to power winches at some distance from ground zero were attached to the cab. After arming of the device in the cab, full control of the balloon was taken over at the control point. At the control panel, the operator visually monitored raising and positioning of the balloon on two television screens, the pictures being relayed by a microwave link. Both pictures displayed horizontal orientation. During Plumbob, balloon accuracy averaged two feet within the required position. According to an analysis by Satoshi Morimoto of Takushoku University, " ... carrying out nuclear tests inside North Korea would be an extremely sticky action. That is because this kind of nuclear testing could only be carried out underground. There is absolutely no way they could do in the air or above ground. Even with underground nuclear testing, you normally need a fifty to sixty kilometer square of desert for a nuclear test. In the U.S., this would be something like the Nevada desert. Unless you have the kind they have in India or Pakistan, you cannot do it. The reason for this is that the underground water system gets damaged. North Korea has a very abundant flow of underground water, and if you carry out an underground nuclear test in this kind of place, radioactive materials would get into the water supply for the whole of the Korean peninsula, and also flow out into the Sea of Japan. As a consequence, if there were any underground nuclear testing in the Korean peninsula, it would not be just the ecological system, but also the topography of the land that would be damaged. So, will they indeed carry out tests? I think they might somehow manage to borrow the Pakistani desert, or else carry out tests in another country. Still, this being North Korea, one can never know. If they did do that sort of nuclear test, then the U.S. would run out of patience." On 11 February 2013, the US Geological Survey reported a 4.9-magnitude earthquake in North Korea, raising fears that Pyongyang had gone ahead with its threat to conduct a third nuclear test. North Korea confirmed it had conducted a nuclear test on 12 February 2013. During the third round of the six-party talks held in Beijing 22-26 June 2004, the chief North Korean delegate mentioned that some elements in North Korea would like to carry out a nuclear test. A senior US official close to the negotiations clarified reports that North Korea had "threatened" to conduct a nuclear test if the negotiations failed. The official said The US official said he would not characterize the remark as a threat. On 03 October 2006, DPRK Foreign Ministry clarified the DPRK stand on new measure to bolster war deterrent. The DPRK Foreign Ministry declared that " ... the field of scientific research of the DPRK will in the future conduct a nuclear test under the condition where safety is firmly guaranteed.... The DPRK officially announced that it manufactured up-to-date nuclear weapons after going through transparent legitimate processes to cope with the U.S. escalated threat of a nuclear war and sanctions and pressure. The already declared possession of nuclear weapons presupposes the nuclear test." [KCNA] North Korea gave no date for a prospective nuclear test, but has said it is necessary to counter perceived U.S. hostility. South Korea's Ministry of National Defense raised the possibility of a fourth North Korean nuclear test. Briefing lawmakers of the ruling Saenuri Party on 22 November 2013 on North Korea's recent nuclear activities, Vice Defense Minister Baek Seung-joo said that Pyongyang is ready to conduct a fourth test at the southern underground tunnel at its main test site in Punggye-ri, Hamgyeongbuk-do Province, located in the northern part of the country. Baek however said there are no signs of an imminent test. According to Baek, the western tunnel of the test site, where the reclusive regime carried out its third nuclear test in February, is now under construction. Seoul's defense ministry also reportedly projected, that if Pyongyang continues operations at its Yongbyon nuclear reactor at the current pace, it will acquire six-kilograms of plutonium by the end of next year, which is enough to make one nuclear bomb. South Korean military officials also reportedly believe that North Korea's capabilities to miniaturize nuclear weapons have improved significantly over the past seven years ever since its first nuclear test in 2006. Although the South Korean government says another test doesn't appear imminent, some experts say it may come sooner than expected, perhaps at the end of this year, or early next year. In the autumn of 1998 a report leaked from Los Alamos Nuclear Laboratory indicated that air samples acquired from the Kharan Desert test by US intelligence aircraft contained traces of plutonium. Pakistan, at the time of the tests, had not had time to develop a warhead from the minimal quantities of plutonium generated by the research reactor at PINSTECH. The most plausible explanation was that North Korea had participated in a joint test of an atomic weapon. It is noteworthy that the second small test at Wazir Khan Khosa, in the Kharan Desert was at such a great distance from the first larger test at Ras Koh, over 80 miles. In contrast, India conducted multiple tests in close proximity. This creates the appearance that there were aspects of the Wazir Khan Khosa test that needed to be hidden from the staff that was conducting the Ras Koh test. It is also of note that Pakistan publicized the Ras Koh test by releasing a video/film of that test, but did not release any publicity concerning the Wazir Khan Khosa test. On 12 September 2004 The New York Times reported on a "series of actions by North Korea that some experts believe could indicate the country is preparing to conduct its first test explosion of a nuclear weapon ... Some analysts in agencies that were the most cautious about the Iraq findings have cautioned that they do not believe the activity detected in North Korea in the past three weeks is necessarily the harbinger of a test. ... One official with access to the intelligence called it "a series of indicators of increased activity that we believe would be associated with a test," saying that the "likelihood" of a North Korean test had risen significantly in just the past four weeks. The activities included the movement of materials around several suspected test sites, including one near a location where intelligence agencies reported last year that conventional explosives were being tested that could compress a plutonium core and set off a nuclear explosion. But officials have not seen the classic indicators of preparations at a test site, in which cables are laid to measure an explosion in a deep test pit." By October 2006 US intelligence officials had detected what they are describing as unusual activity at potential North Korean nuclear test sites, although they had not been able to determine the precise nature of the activity. North Korea can conduct a nuclear test with little or no advance notice based on imagery observations alone. According to 38 North, a US-based North Korea monitoring site Pyongyang appeared to have altered its test preparation practices in order to make them more difficult to detect, as demonstrated by its fourth nuclear test on 06 January 2016. The site said previous images suggest the reclusive state may have already finished digging several underground tunnels at its main nuclear test site in Punggye-ri, which would allow them to conduct another test "with little or no warning."